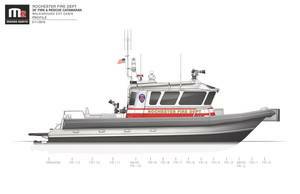 Moose Boats, a boat designer and manufacturer in the San Francisco Bay Area, was awarded a contract from the City of Rochester, New York Fire Department for the construction of the first M2-38 Fire Rescue Catamaran to be delivered to the Great Lakes. Twin Cummins 425hp turbo diesel propulsion engines, Twin Disc transmissions and Hamilton water-jets will power the M2-38 aluminum catamaran. Rochester Fire's new Moose Boat will be equipped with a fire pump system flowing over 1,500 gallons per minute of fire suppression water to cabin roof and cockpit mounted monitors while simultaneously maintaining full maneuverability from both propulsion engines and jets. An integrated 5" diameter discharge will allow Rochester Fire to flow water to land based fire apparatus where hydrant systems are not present. Rochester Fire Department's boat committee brought vast experience, several specific requirements and a cohesive approach toward developing solutions with Moose Boats. The Committee opted for an extended walk-around cabin configured with three shock-mitigating crew seats, an incident command/navigation station an 84" patient bench with EMS storage below and an integrated deck level head enclosure. Dedicated hose storage is planned for the underside of the gunwales and weather-tight enclosures in the fore deck and aft deck will house firefighting foam and the additional valves, nozzles, tools and hardware necessary to respond to a wide range of fire and rescue scenarios. The navigation and electronics suite is comprised of multifunction navigation screens, radar, 3D side scan sonar, AIS, VHF radios, radio direction finder and a thermal imaging camera. A heavy-duty push knee will enable the M2-38 to come in contact with larger vessels and piers while the combination ladder will allow fire fighters to disembark in beach landing scenarios and facilitate dive and rescue operations from the stern. The City of Rochester used New York State DASNY Grant funding and GSA's Schedule 84 Cooperative Purchasing clause to procure the boat from Moose Boats' GSA pricing schedule. The Rochester, New York Fire Department (RFD) has jurisdiction on the Genesee River and Lake Ontario. The Port of Rochester is home to over 1,000 seasonal and transient slips including the City's new marina, the Rochester Yacht Club, several private marinas, and a cement shipping terminal. The port of Rochester is also a safe harbor of refuge for the main Great Lakes shipping channel that passes in front of the port. Monroe County in which Rochester resides has the 2nd largest number of registered boaters in the State of New York. The RFD's new vessel will work in conjunction with marine resources from U. S. Coast Guard Station Rochester, U. S. Customs and Border Protection, the New York State Department of Environmental Conservation, and the Monroe County Sheriff Marine Unit to protect these assets and respond mutual aid with neighboring marine emergency response agencies along the south shore of Lake Ontario.